Medieval Architecture essays discuss the two styles of architecture and the purposes of their building types. The Medieval Era produced many different types of artistic styles. You may have to do a research paper on medieval art, painting, sculpture or architecture. Paper Masters can help you write your Medieval Architecture research paper by assigning one of our writers to your topic and producing a custom written medieval architecture research paper. Medieval architecture can generally be divided into two types and two styles. The two types refer to the main purpose of the building, either religious or military, while the two styles, Romanesque and Gothic, were chronological developments. Like much else in the Middle Ages, religion dominates the architecture of the time. Churches and cathedrals were constructed largely on a cross-like floor plan. The earlier constructed churches were modeled after the Roman basilica. These buildings had a central nave, which ended at a raised apse. The churches also had a transept intersecting the nave past the halfway point in order to complete the cross shape. Medieval architects borrowed heavily from the construction of the Roman Empire. The use of arches and barrel vaults, copied from the Romans, is known as Romanesque architecture, and was prevalent during the 11th and 12th centuries. By the end of the 12th century, a new cathedral building style began in France, and quickly spread across Europe. 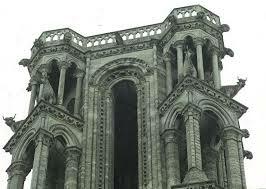 This was Gothic Architecture, with lighter and higher walls that incorporated magnificent stained glass windows. Arches became pointed, and flying buttresses spread the weight load in order to allow for high vaulted roofs. Medieval secular architecture can be seen in the many castles and fortifications that remain. These buildings were defensive in nature, with thick stone walls and narrow windows, or roof crenellations, which would allow archers to fire arrows. Middle Ages Peasants research papers discuss the living conditions of peasants and the expectations of them from the church. Middle Ages Music from this time period and can be found in the Gregorian Chants performed by monks. Order a research paper on Middle Ages Music from Paper Masters. Medieval Torture Devices term papers look into famous medieval torture devices and describe how they were used. Medieval Art - Medieval Art term papers discuss the religious and non-religious aspects of art from the middle ages. Medieval Canon Law- Medieval Canon Law Research Paper explores medieval marriage laws. Medieval Family Law- Medieval Family Law Research Paper opens up with introduction to laws during that medieval period. Medieval Games - Medieval Games term papers various entertainments and games performed by the people of the Middle Ages. Medieval Geography and Politics- Medieval Geography and Politics Research Paper looks at the different empires that existed during the middle ages, and their leaders. Paper Masters writes custom research papers on Medieval Architecture and discuss the two styles of architecture and the purposes of their building types.